This book aims to develop four key challenges that remain unresolved in the boundary-spanning literature, which span from the conceptual, to the practice, to the translational. In doing so, it tackles the question of boundary-spanning from four different angles, providing an in-depth investigation of the current state of the field in each of these realms, in addition to new directions for solving the identified challenges. Finally, the book synthesises the lessons from each of these challenges into a coherent and integrated final piece of the boundary dilemma. In doing so, it will provide depth and a clearer agenda for future research and practice. 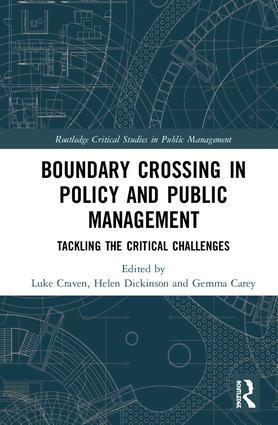 Crossing Boundaries in Public Policy and Management digs into the heart of enduring questions and challenges for cross-boundary working, providing in-depth conceptual contributions on the fundamental challenges of boundary work. It displays the latest state of knowledge on the topic and will be of interest to researchers, academics, practitioners, and students in the fields of public management, public policy, public administration, public-private relationships and coordination and collaboration. Section 4: Where Next for Boundaries? Luke Craven is a Research Fellow in the Public Service Research Group at UNSW Canberra. Helen Dickinson is Associate Professor of Public Service Research and Director of the Public Service Research Group UNSW Canberra. Gemma Carey is Associate Director and the Research Director of the Centre for Social Impact UNSW and an NHMRC Fellow.